Why do I keep trying to simulate the TB? I don't know. But if you haven't gotten sick of the sound of this crazy machine yet here is another simulation. What is it about analog filters that makes them sound so great? I'm not sure but one way I have been able to make a filter sound less digital is by adding some overtones to it. The problem then was that I was not able to sweep it as high as I wanted. I use an if statement to branch around an overtone if it gets too high in frequency. The tables control the frequency, amplitude and band width of the overtones. Cranking the volume on these will result in some wild sounding filters. When using butterbp I found that a bandwidth based on the frequency raised to a power seemed to create a constant amplitude when swept across white noise. I also fade out the overtones as Q goes to zero using iq3. Otherwise they start dominating everything. Here is my attempt to create a bandlimited synchronized oscillator with a triangular waveform. The shape looks right and the sound is very much like my Matrix 6R's oscillator sync. For some reason I had to go to sr/4 for the impulse. Basically I generate two bandlimited impulse trains. 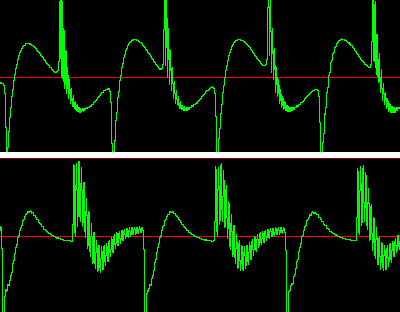 The first one is integrated to form a sawtooth wave. The second impulse is subtracted from the sawtooth wave but the second impulse is first scaled so that it is always the magnitude of the sawtooth wave. That way the sawtooth gets reset to zero. Finally there was a problem when both impulse occured at nearly the same time. To avoid this a window is set up that prevents a second reset from occuring when one is about to occur anyway. The file bouncepl.txt is actually a Perl program. You can rename it as bounce.pl when you save it to your computer. For some reason I was not able to download it when I named it bounce.pl. The Perl program is used to generate scores based on a bouncing ball. The equations are a little like the mass spring system. This time acceleration is provided by gravity. The ball has certain characteristics such as elasticity and pitch. This has an excellent discussion of the mass spring system and how it relates to chaos. Moving sound source with table supplied moving X and Y coordinates, volume decreases as 1/r^2, filtering of sound due to air absorption, Doppler effect due to moving sound, simplified HRTF for head shadow filtering, inter ear time delay, speaker cross-talk cancellation based on both inter-ear time delay & head shadowing, room reverberation which varies with distance. The algorithm is 2-dimensional and does not attempt to introduce height cues...but that might be a fun exercise for someone ambitious. I was asked to provide a flow diagram of this system and after some thought I decided that it was best to consider the mass spring system as a single block. Otherwise it will no longer make sense when you replace the simple Euler approximation with a more complex Runge-Kutta approximation. Notice that a damping factor is used on the velocity. A variation on my industrial noise. This example loops a small section of a sample and passes it through a filter. The cut-off frequency of the filter is passed as a table to the instrument. Use any complex sample with it or download machine.wav. This can be used to create sounds like industrial machinery. Here is a simulation of a drum machine snare. I start with an impulse from vco and filter it for the drum tone. I mix in some high pass filtered noise for the spring. This instrument uses a dynamical system to generate intermittent "pops" which sounds ranging from a scratchy record to a glass being filled with soda. This is a crunchy little analog sounding synthesizer. The low pass filter resonance is "extracted" and passed through a waveshaper to clip it before it is rejoined with the low pass signal. This is an instrument created by generating two spherical lissajous curves and applying an exponential envelope to them. For more information on the spherical lissajous curve see the Spring 1999 issue of Csound Magazine. The spreadsheet file can be used to generate random chime sound events. Save the file as a text file named chime2.sco or something similar. The score provided was generated in part by using this spreadsheet.